Of all the problems we have in life boredom is something every person has to deal with at some point in life. 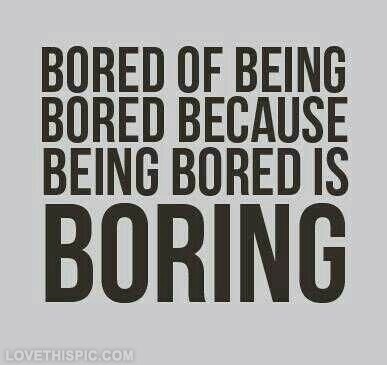 Only few crack this ‘boredom’ and for most of us its a nightmare. Habits stem out of boredom. Good or Bad. Habits make our character and character makes us feel better. You feel bored with a person, a place, a movie or by just sitting in isolation doing nothing. Its in isolation we create our worst habits. Boredom in isolation makes you or breaks you as a person. If i observe right one wishes to runaway from boredom by completely going out of discipline, mostly sabotaging the self with habits. Boredom drives you to have a drink so that you can beat it to death. Stay high so that you don’t feel it anymore. Only when I’m bored so much that I feel like peeping into others life more and less into mine. Unlock the phone and peep into it until my time and neck is strained. How do you stay disciplined in life even when you are bored and what is the devil which drives you to go out of discipline is the fundamental problem which has to be addressed. So how do you approach this discipline in life which in itself is boring. What is the quality of discipline which makes it so boring that you don’t want to stay disciplined. May be we don’t care about life anymore. May be we don’t fear death anymore ( which is actually good ). May be it doesn’t matter anymore because life is hard for us though we are good with people. Always. May be we were repeatedly knocked down with defeat, that only failure is tattooed everywhere. Then we start breaking bad. Only when we unlock our potential fully and deal with all the lemons which life gives us, we have a story worth sharing. Which is our story and I’m telling you, only when the last chapter of the story is good its worth a read. So in life we are all working for this last chapter to be told and most of us want it to be good. Only when we deal with discipline better we can create a good life so that we can shape those last chapters. When we are bored its better to listen to our Heart and see what kind of pages have to be written when we are dying. So that we create better habits. So that we die with a character worth reading.